The Hub and I cleaned the pond this past weekend. 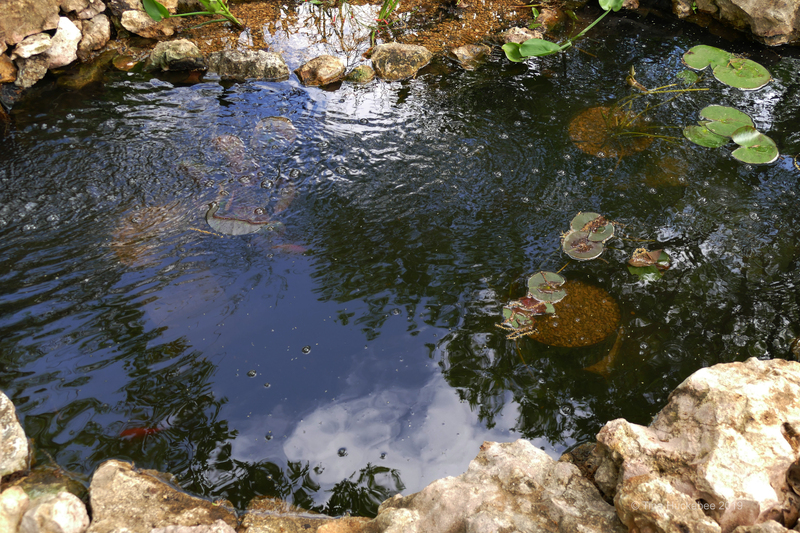 While unnecessary for the health of an aquatic environment (pond scum smell isn’t the least bit off-putting for the fish, plants, or insects), we start anew each spring with a thorough cleaning. Occasionally, we’ve skipped the chore in favor of other demands. Fish were removed and stored in containers for the day; water was drained into the gardens, which love the rich liquid; lilies and bog plants were separated, then re-potted; leaves and pond-bottom gunk was scooped out, bucketed, and dumped into the compost bin. The aquatic environment is now refreshed and renewed for a year of lush growth. After the work–it’s a long day–I photographed the less foliage-covered, fresh watered pond. I’m struck by what this shot shows. Aside from the beauty and diversity that a pond (clean or otherwise) brings to a garden, what caught my imagination was representations of the traditional, though unscientific, four elements of the Western world: Earth, Air, Fire, Water. Water: it ripples and supports pond life. To the left of the photo, unseen, is the waterfall. The force of the waterfall, combined with whatever breeze exits, moves the water across the pond, in gentle, incessant movement. Air: the rippled water reflects the blue sky and white clouds. In Air, but part of Earth, the overhanging trees are mirrored in the Water, bookending the clouds and sky. Earth: limestone rocks border the pond. These rocks are from the cemetery where our lily/our daughter, Shoshana, rests, and are as solid and permanent as our love for her. The three pond lilies also rest–under water–which breathes life in each; rocks hug that source of life. Fire: of a sort, in the sparkling Texas sun as its rays reach, and touch, Water. This entry was posted in Pond Gardening, Pond lily, Pond plants, Uncategorized and tagged Wednesday Vignette by Tina. Bookmark the permalink. Wonderful post, Tina! Sure, the Four Elements may not be scientific, but that ephemeral beauty of the components holds the spirits that bring the scientific hardware to life. There is a lot to be said for that! Thanks, Anna. I agree and I guess that’s what I saw in the photo, as well as its subject. Looks sparkling. A job well done! Beautifully written! One of the rare posts where the words convey depths the amazing photograph can’t quite reach. Thank you! Awe, thanks Deb! I liked the photo and I’m glad that I could express what it evoked for me. Beautiful words! Thank you for your insights. Thank you for reading, Robin. A lovely, touching post. There’s a time for science, but there’s a time for poetry, too, particularly when the pleasures and sorrows of life can’t be contained in scientific categories. The reflections and ripples are especially nice. Thank you, Linda. Humans crave both–science and art–to accommodate life. The child in us never outgrows the delight in messing about with water. And lovely to have a sparkly clean pond. Remind my back about that next year. 🙂 But I agree, it’s always a sense of accomplishment to renew–whatever! Looks like a big job, but well worth it.